I remember I saw a quote once that said being a writer basically means having homework every day for the rest of your life. As much as I would like to say I can't relate and that writing is always a blast 100% of the time, sometimes it feels like that - homework. On the days writing feels like my high school physics class all over again, I have a few tips I'd like to share about how I get out of my own way and start writing. This worked for me this past weekend. I didn't want to stare one more minute at the short stories that had rendered me inspiration-less. Instead, inspired by a song I was listening to, I started something new. As a result, it led to 1,000 word count that day. Something I hadn't done in a long time. If you are sick of interacting with the same characters, same stories, same plot line, try something completely different. Work on a brand new story. Can't get the juices going? Try free-writing for a while. 2) Find a writing prompt. What I love about writing prompts is that it usually pushes you to write for a genre that you likely never thought to write about before. If you don't write fiction, there are some nonfiction prompts that will get your juices flowing as well. In fact, check out this list of prompts that the NY Times provided. 3) Write to the beat of the music. I confess, when I write to music, I tend to listen to a lot of Harry Potter and Lord of the Rings soundtracks. If that sounds like you, try something different. Next time you are about to write, listen to music that your character would likely be listening to. If you are writing non-fiction, listen to music from the era (or best represents the era) that you are writing about. One tactic that you may want to try while writing, is while you listen to music, write about the first thing that comes to your mind when the song plays. Better yet, turn on the radio to a random station. With every change of song, change the direction and tempo of your story. I tend to write sporadically, but I find when trying to develop a better behavior, if I make it a habit, I am more likely to do this behavior more often. So, set yourself a schedule time to sit and write. Even if all you do is stare at the blank page. Keep going back to your dedicated writing time without fail. Even if you don't write a single word. Maybe it's your lunch break at work. Maybe it's before everyone else gets up in the morning. Maybe it's after everyone goes to bed. Maybe it's during your weekly laundry session. Dedicate a time to writing and don't break that date. Even in your most unmotivated slump, keep going back. You won't regret it. 5) Embrace the very thing that leaves you uninspired. 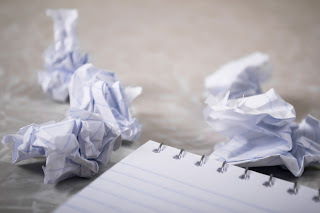 What is that has given you "writer's block"? What makes you feel uninspired? Is it the weight of family responsibilities? Your job? Your bills? Maybe it's a sadness or traumatic experience that has hit your life that just weighs you down. Maybe it's everything. Maybe it's nothing. I came across on article on Psychology Today that talks about getting out your own way and it struck a chord with me. The article basically says the artist "...who sits down to work engulfed in 'stuff'' yet doesn't give these thoughts and feelings a negative connotation...this artist has truly gotten out of his or her way." So instead of letting the "stuff" in your life drain your creative energy, use that "stuff" to inspire you. Turn things around and write about the very thing that bogs you down. Talk about this "stuff". Write it out. List all the reasons you shouldn't write and write out the list of why those reasons are wrong. When you have no other reasons (or "stuff") left to excuse you from writing, time to sit down and write. Follow Nicole Pyles and her writing journey by visiting her on Twitter @BeingTheWriter. Nicole--I enjoyed your post. Your last suggestion was especially intriguing. Also, I went to the NY Times list of writing prompts and printed it up. In my opinion, it will be a great resource when my students work on essay writing. When one of those specific ideas included on that list is chosen to begin an essay, it will give my student writers a chance to change gears (and directions) in their essays. Thanks Sioux! Yeah that last suggestion is one I would like to do more often. Glad that list of prompts will help your students! This is an inspiring list of writing boosts, Nicole. :) I've never thought of listening to soundtracks while writing!That's a great idea. The prompt lists are fantastic. Great post! Writing prompts never work for me. I already have too many projects, I don't need more. As for music, nothing will make me get out of the soundtracks / opera / classic rock triangle. And when it's opera, I can't pay attention to anything else. I love the NYT writing prompts you shared! What a great idea. I always struggle with writing creative non-fiction because I'm never sure what to write about but these will give me some great ideas. I can also see the point of the Psychology Today article. If it weren't for my own "stuff," I wouldn't be able to write half the things I write, but my anxieties and insecurities prevent me from having the courage to follow through on so many projects!